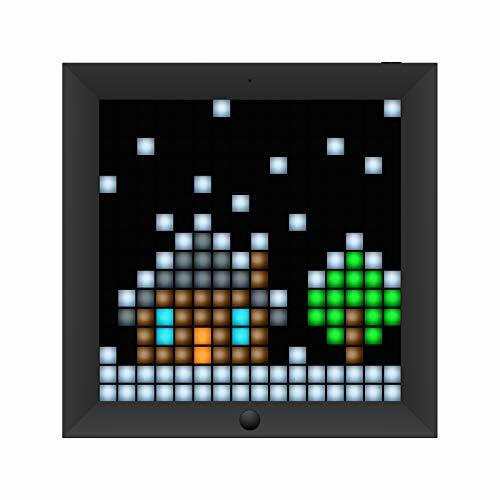 Light up your life with Divoom, a Lite Brite for the twenty-first century and perfect for all ages! Divoom combines modern interactive pixel light art with the charm of nostalgic 8-bit graphics. With a few taps of your fingertips, create unique pixel art designs or display one of thousands that are pre-programmed and shared within the pixel art community. The 8-bit graphics are reminiscent of early Nintendo and Atari artwork, with the square pixel displays. Bring up Mario or a Pac-Man Ghost on your display, or any of your old favorite 8-bit characters. Create 8-bit versions of modern characters, too, or design flashing light patterns. Even add words to scroll across the screen. You are only limited by your imagination. Thanks to modern technology, however, these little light boxes do so much more than display your artwork. These pixel art displays are also smart clocks that sync with your phone for call and text alerts, social media alerts, and calendar reminders. Some of them are also Bluetooth speakers that deliver high-quality sound for the music from your phone. 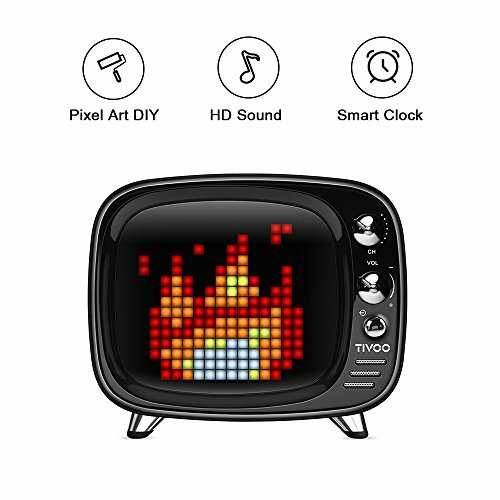 Divoom features fantastic modern design shapes, too, including the Tivoo, a retro-looking television set. The Pixoo frame is sleek and easy to hang on the wall. The Aurabox and Timebox sit nicely atop small tables and bookshelves. Some of these little gadgets even fit in your pocket. Use the Divoom app to program these LED pixel displays from your phone. The LED editor lets you switch between images and text, and string different programs together to create animations. Manage all your alarms and alerts, too. Set up several Pixoo display frames around your home for a cool decor theme. Program them to show the time, the weather, and your calendar as a modern-day command center. Place a Timebox Mini in every bedroom, programmed to each family member’s individual sleep needs. Create ambient mood lighting with any of the Divoom displays for a cozy night in. And always have an Aurabox or Tivoo on hand for music and lights on the go, turning any gathering into a party. 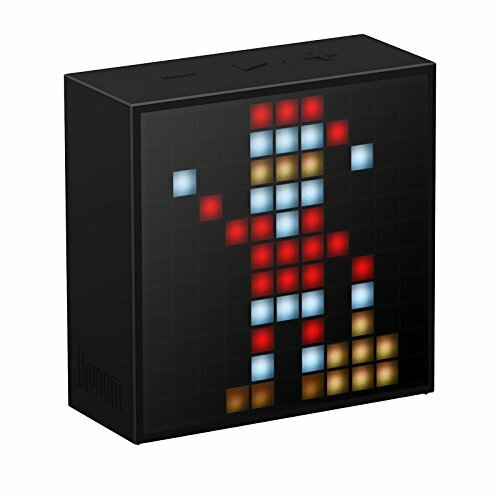 Your creativity will light up with one of these Divoom pixel art displays. Unlike the original Lite Brite, you don’t have to worry about losing those little plastic pieces and stepping on one hidden in the carpet. SUPER HD SOUND & POWERFUL BASS - As a bluetooth speaker, TIVOO is serious. TIVOO not only uses the selected high-quality hardware material, simultaneously uses the small volume bass dynamic compensation, the 360 degree 3D space compensation, the high power explosion proof sound and so on a series of acoustic algorithms, effectively makes the same volume of the box to obtain the better hearing effect. Under 75 signal-to-noise ratio, V5.0 blutooth, support aux & bluetooth & sd card. DIY YOUR OWN PIXEL ART AND SHARING! - The most classic and fancy pixel art are in this pixel art speaker! 16*16 pixels and 256 full RGB self- programmable led screen, You can create any pixel images and animations by our app, just draw by your fingertip! We also got a pixel art community on the app, people in here make an online gallery, we create our unique pixel art and share with others. Traditional animation characters, game character, super hero, and emoji, more than your imagine! MUCH MORE FUN! MULTIPLE FUNCTIONS IN THE APP! - Not only pixel art creation, TIVOO pixel art bluetooth speaker got more interesting functions, all in the app. It can use as a smart alarm clock, shows the time and weather, schedule your daily life. 24 professional sleep-aid profiles make you have a good sleep. Traditional pixel games, voice memo, DJ mixer, Social media notification. More interesting functions waiting for you to try! BEST GIFT EVER! - If you're upset about not knowing what kind of gift to pick for others, don't hesitate, TIVOO pixel art DIY bluetooth speaker will be your best choice. Retro and funky TV shape appearance, super strong function and classic pixel art, first-class sound quality, powerful bass. No matter where you put it, it can be the most stand out decoration. Perfectly show your taste! YOUR INVESTMENT IS FULLY GUARANTEED - This TIVOO Pixel Art DIY bluetooth speaker are manufactured under very strict quality standards to give our customers best experience. For any problem, you can contact us and we will reply you immediately to solve all of your worry. In addition, we offer a FREE REPLACEMENT POLICY without any costs from your side and 1-YEAR MONEY BACK GUARANTEE, totally no risk for you! Just add to your cart now! It looks like a cute retro television set, but it fits in your purse or backpack and blasts amazing sound. Take the Tivoo Bluetooth speaker with you anywhere for high-quality music synced from your phone. It’s a party to go but the retro look is attractive on a table top at home, too. Use the Divoom app to program the graphics and set up alarms and social media alerts. With the Tivoo Bluetooth speaker, turn on the fun and take it with you. Create artwork that lights up with 256 pixels and millions of colors to choose from. Use the Divoom app on your phone to plan your pictures and animations then display them on the Pixoo digital frame. Combine one frame with up to three other Pixoo digital frames (sold separately) for even more dynamic light displays. The slim frame is easy to safely mount on the wall. Upload your designs to the Divoom collection and share your work with other pixel art fans around the world. There are thousands of pieces of shared artwork in their collection already. Join the pixel art movement. Or enjoy your own personal glow. The Timebox Mini alarm clock does it all — even puts you to sleep. 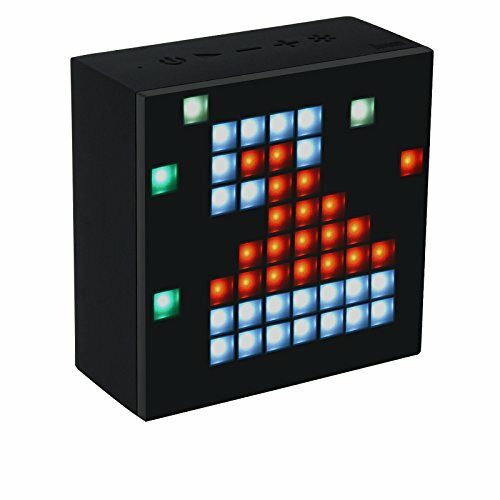 Featuring a variety of LED pixel art animations and audio tracks, you can program the Timebox Mini with soothing music or white noise at bedtime. Then use it to wake you in the morning with any number of sounds, music, and light displays. It includes FM radio, too. Sync it to your social media for alerts and use it as a daily planner, too. Assign a different piece of artwork for every event reminder in your calendar. The Timebox Mini really is small — about 2 by 2 inches –so it’s portable. Bring it along when you travel. A good night’s sleep is in the bag and you’ll wake up on time and refreshed in the morning. Greatly improve the sleep quality with the built-in temperature sensor + Intelligent timer clock with both sceneries and sound, All speakers purchased through the Divoom's official Amazon store (Divoom Official) come with the one year limited warranty. Experience awesome sound quality and eye-catching light displays with the Aurabox Bluetooth 4.0 smart LED speaker. The Bluetooth speaker connects to your phone and is compatible with your music apps. With the Divoom app you can also program white noise to help you sleep. Create pixel art to display and edit them together in animation. The 10 x 10 pixel display allows you to create some bold designs. Sync the speaker to social media for notifications, too. What’s a party without cool lighting? Listen up, and enjoy the fun mood lights, too.